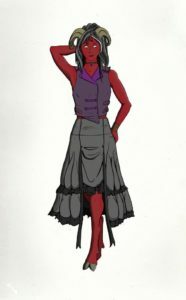 Rivane is a Tiefling alchemist with a questionable throwing arm. The Wintermane name was a prestigious title held by a noble family; one who profited from a mining town, situated away from any major city. As the ore reserves began to dry up and industry changed, Aralin Wintermane made a deal with a dark being; restore power to his family name, in exchange for 200 years of life. The family retook its seat at the top with Aralin and his new advisor. His gifted powers changed him and the desire for renown consumed his thoughts. Like all demonic bargains, it didn’t work in his favour and as time passed, his powers waned while his debt continued to grow. On the eve of his death, Aralin begged to be spared and had the debt moved to his heir. The demon seized the opportunity to profit from the fool’s delirium and altered the deal. While the powers continued to fade, the Wintermane legacy took on a new turn as whispers spoke of the now-cursed bloodline. Generations came and went as the once-honoured family fell into disgrace; its proud visage now a deformed, horned menace to the land. As she came of age, Rivane Wintermane renounced her heritage, changing her name to Winterwisp to pursue a new life of her own. From an interest in mixology, she established a brand to rule them all: Winterbrew – The Cure For You! Using her distinctive appearance to allure and a dash of wit to charm, Rivane peddled her wares to many folk across the land, always leaving the scene before any deception might come to light.